COMPUTER SIMULATION OF FLUTTER ELEMENTS OF A SYMMETRIC AIRFOIL USING THE VIRTUAL BOUNDARY METHOD FOR FLUID-STRUCTURE INTERACTION. THE WIND AND THE CITY: EVALUATING THE LIMITS TO APPLY NATURAL VENTILATION FOR THERMAL COMFORT IN DENSE URBAN SETTLEMENTS USING A COMPUTATIONAL FLUID DYNAMICS TOOL. 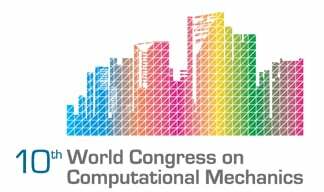 The 10th WORLD CONGRESS ON COMPUTATIONAL MECHANICS (WCCM 2012) took place in the vibrant city of São Paulo, Brazil, 8 -13 July 2012. This tenth edition was an opportunity to meet distinguished colleagues, have a fruitful exchange of ideas and also feel the Brazilians' reputation as a warm and friendly people. With over 1800 quality papers from 92 different countries, we are sure that it was an outstanding, enjoyable and memorable congress. We wish to express our gratitude to all participants for the high quality of their contributions, to the plenary and semi-plenary lecturers for the high motivating presentations, to the sponsors for their generous support, to the local organizing committee for its wonderful managing effort and to the people from SOMA for its splendid assistance before, during and after the congress. Thank you for the success of our congress.